Executive Suite isn’t a conventional business simulation. You don’t track money or statistics or care about helping the company. 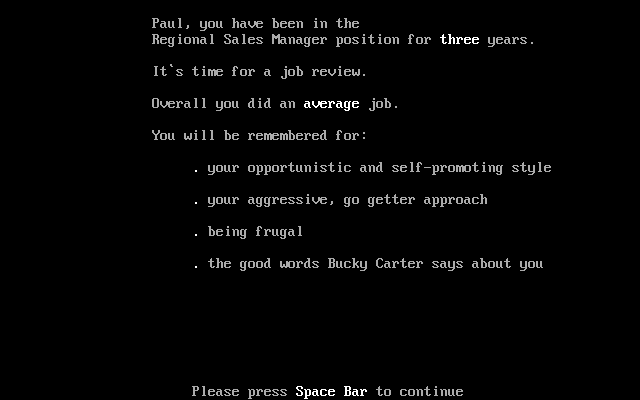 Instead, you roleplay a newcomer hustling for the top seat at your company. You’re in this for yourself. It’s a choose-your-own-adventure story not far from the movie Wall Street and its stressful lifestyle. And although Executive Suite mocks the business world, it appreciates that your problems, no matter how small, don’t always have a clean solution. Success in Executive Suite means more than hard work and honesty. Your standing among colleagues and your willingness to take smart risks matter too. 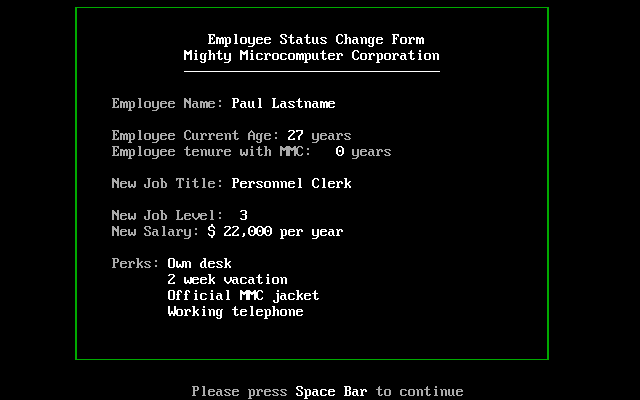 After you interview at Mighty Microcomputer Corporation, you can pick from a handful of positions fitting your skillset. You spend a year or two in that job tackling uncomfortable situations. What happens when your coworker asks for a suspicious favor? Or when they pick a fight with you? Or when you’re caught in something sillier, like trying to make small talk with beloved company president Malcolm Farnsworth III? Eventually, you can get a spot in a new department – provided management still likes you. Office politics spring up in even the lowliest positions. As a maintenance worker, you might need to turn the lights on without your supervisor’s permission to help with the night shift. Basically every choice here will cause you trouble: you’ll either rankle your boss or do a poor job. Instead of looking for the correct options, you need to manage your reputation. Leaving the wrong impression could get you held back or fired. This constant pressure was frustrating at first. I expected safer choices for default good employee behavior, but you could jeopardize your job by skipping drinks with coworkers to work late. (You get known for your work ethic, but your performance review notes your “antisocial attitude.”) The game didn’t click until I started to roleplay. 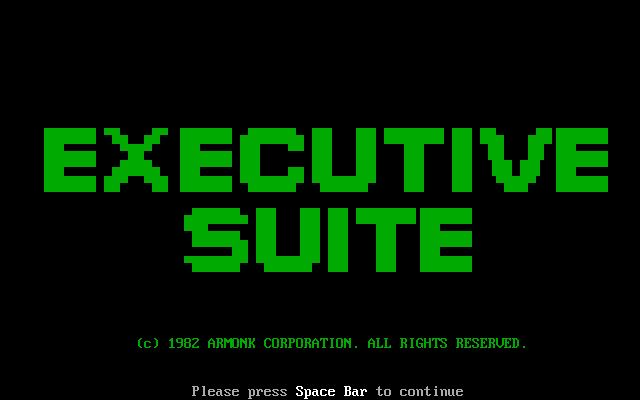 Executive Suite was released in 1982, a time with very different expectations for succeeding in business. 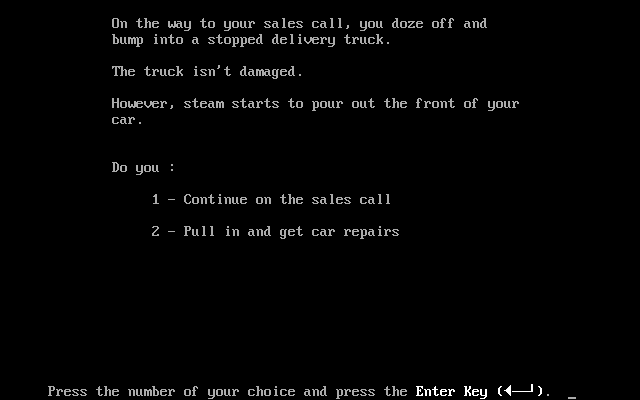 The game exaggerates that culture for satire – your perks as a personnel clerk include a “working telephone” – but it still asks you to take part in the aggressive careerism. You can’t coast through this one. You have to play the shark. As you move up the ladder (occasionally stalling when the economy shrinks), Executive Suite raises the stakes of your choices. Everything is heavily scripted, so while you won’t find any surprises the second time through, each job has an arc. Entry-level white-collar employees have to balance their work and social obligations: do you accept the company’s request to turn your family vacation into a business trip? Skilled assemblers can join a union and alienate their bosses or decline and face scorn from their peers. Your car will probably explode, but the show must go on! Then, closer to the top, you’re roped into serious management scenarios and corporate intrigue. Should the company expand to new clients or focus on keeping the old ones? If you’ve developed a new technology, do you give MMC first dibs or keep working on it in private? In one scene, you find a binder of a competitor’s trade secrets. With career advancement on the line, there’s no obviously right thing to do here. How you handle this lucrative, probably illegal intel will determine your future. This is a unique way to escalate difficulty, not through harder mechanics but harder decisions. Missing your deadline as an accountant could wreck your career just as badly as joining a shareholder revolt, but the big, serialized questions weigh on you, especially if they rub management the wrong way. The higher you go, the more your actions matter – and the less comfortable you can be. The only imperative is to stick your neck out and think about your future. That’s a hard mindset to adopt. Of course, Executive Suite makes fun of that mindset. The game ends by assigning a dollar value to everything in your life, including the family you’ve probably neglected. Between the snarky jokes, Executive Suite shares a kernel of truth about professional life. Problems usually don’t have right outcomes. Sometimes self-preservation is the only important factor. That’s not exactly optimistic, but the game’s refusal to let you play the standout worker is a frank and unexpected challenge. I’ve been playing this a little bit because I saw it here. I really love all the contemporary 80s references, done in a way only a game actually of the time period (rather than a modern throw-back) can pull off. Also the choice of “undecided” on the gender select kinda surprised me for a game from 1982. Makes me realize how sometimes our culture goes into regression and we forget or intentionally erase gains made in previous decades before rediscovering them for the first time. Anyway, gameplay is great, and, as you say, it is fantastic at giving you that roleplay experience. Before you know it you are picturing yourself having power lunches at a sushi bar, reading “Real Men Don’t Eat Quiche,” fighting off both domestic competition and “Nippon Corporation,” and carefully choosing which executives to befriend and which to throw under the bus. Fantastic fun that tries your soul.